Springtime in the Smoky Mountains is a nature lover’s paradise. Two major events occur in April and May, centered around Great Smoky Mountains National Park. 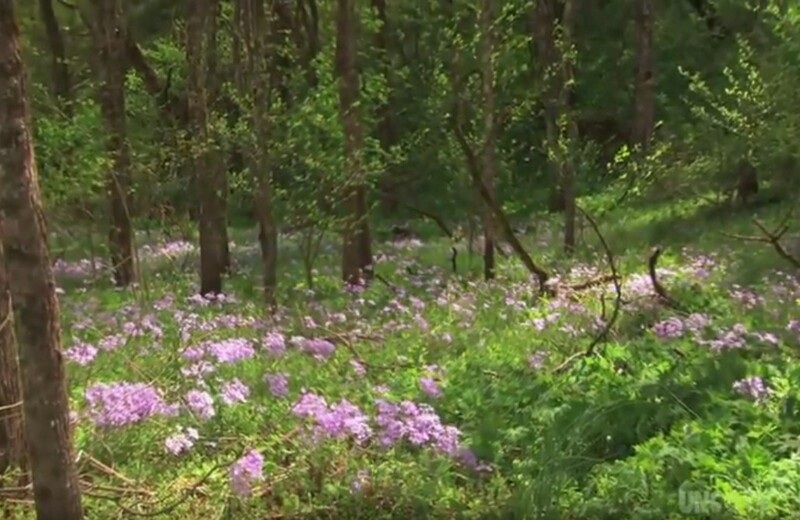 These are the annual Spring Wildflower Pilgrimage, based in the national park close to Gatlinburg, followed by the annual Wilderness Wildlife week, based in Pigeon Forge. Both events offer expert guidance to some of the most breathtaking and rare highlights of the seasonal changes. The springtime period after Easter marks the magical time in Great Smoky Mountains National Park when millions of wildflowers bloom for a brief time, one step ahead of the trees blooming, which will cover the skies above with foliage and plunge the forest floor back into deep shade. For a few weeks, 1,500 species of wildflower cover the ground everywhere, and April 21-25, 2015, marks the time of the 65th Annual Spring Wildflower Pilgrimage. Participants come from around the world to catch sight of rare wildflowers and to learn more in the 150 or so classes and treks provided by organizing groups and Park rangers during the 5-day occasion. The weather is mild, and often moist, and it’s a perfect time to breathe in the great outdoors and take a guided tour or hike. Participation in all events is by pre-registration, and many people plan a year ahead of time. For full information, see our guide to The Spring Wildflower Pilgrimage in Great Smoky Mountains National Park. For a week in May, Pigeon Forge fields a rich array of programs that are free to the public and celebrate the rich history, culture and natural features of the area, particularly in Great Smoky Mountains National Park. The event draws a variety of experts from all over, and the range of classes, demonstrations, lectures, hikes and fun activities jammed into 7 or 8 days is such that it takes about a 60-page brochure to list them all. Many of the events are designed as one-hour classes, along with guided hikes in the national park. The spacious LeConte Center in Pigeon Forge is the headquarters for Wilderness Wildlife Week, a p[perfect place since as many as 100 exhibits and booths may be hosted to deal with the various subjects of the week. From photography to fishing, from music and art to hiking and nature study, and all the relevant natural sciences, topography and lore, Wilderness Wildlife Week offers a vastly diverse display of the wild, its plant life and its inhabitants. Something in all the programs is there to captivate everyone. The event is aimed at being fun for kids, and makes a great school and home-school field trip. For more information, see our guide to Wilderness Wildlife Week. Of course, there are many more things happening at this time in the area, from festivals to shows to attractions. For a calendar to the main events of this season, see our guide to Festivals and Events in Gatlinburg and Pigeon Forge. Springtime in the Smoky Mountains is a magical time filled with many events and growing excitement, in this transition time from winter to summer. After Easter, it’s also a slow time for traveling, with kids at school, and no holidays in sight just yet. This is a good time for off-season deals, and with millions of Americans within a day’s drive of Gatlinburg, our last-minute specials on cabin rentals can be useful for a weekend getaway on the spur of the moment. Most people plan their trips long in advance of course, which is certainly the way to treat the two events above – some people plan a year ahead based on the timing of these events. And booking the perfect cabin is best done long in advance also – see our Tips on Finding the Best Cabin for more. The month of May is the most popular month for weddings in the Smoky Mountains. And this is an area hugely popular for weddings, and all things romance. See our guide to Smoky Mountain Weddings for more information on this most important of days – and also learn about our perfect Gatlinburg honeymoon cabins for your stay after the ceremony. But if you can’t make springtime in the Smokies, everything is still just fine, because any time is a good time to be in the Smoky Mountains!